In Montana, people spend a lot of time out under the Big Sky. Whether working, hiking, or hitting the slopes, a hearty breakfast is an essential start to the day. And few things fit the bill as well as a delicious omelet: Protein packed with all sorts of good-for-you fillings. These are our favorite spots to grab an omelet in Montana. For a couple of decades, Main Street Overeasy has been helping hungry folks in Bozeman get their days off to a great start. Of course, no self-respecting breakfast spot would be found without omelets on their menu, and the Overeasy is no exception. If you’ve got a big day ahead of you—on the slopes, on the river, what have you—get the pig farmer’s omelet. You may need a nap, but you won’t be hungry. In the capital, omelet lovers have nothing to worry about because they have the No Sweat Café. Their build-your-own omelet can be made from all sorts of awesome, fresh ingredients like broccoli, chilies, feta or avocado. Add potatoes and toast, and you will walk away smiling. In Billings, the Red Rooster Café is one of those classic diners that makes its own jams and serves up delicious pie. But you don’t want pie (not right now anyway). You want an omelet. And the Red Rooster has those, too. Go for the Granny Special, with country sausage, peppers, onion, and cheese. Omelet enthusiasts in Butte enjoy the awesome omelet selection at Gamer’s Café. You can certainly get your classics like ham and cheese or a veggie omelet, but why not add a little sabor? Go for a Spanish or chili cheese and chicken omelet. Julie’s Center Street Café is the place to go for your omelet fix in Kalispell. 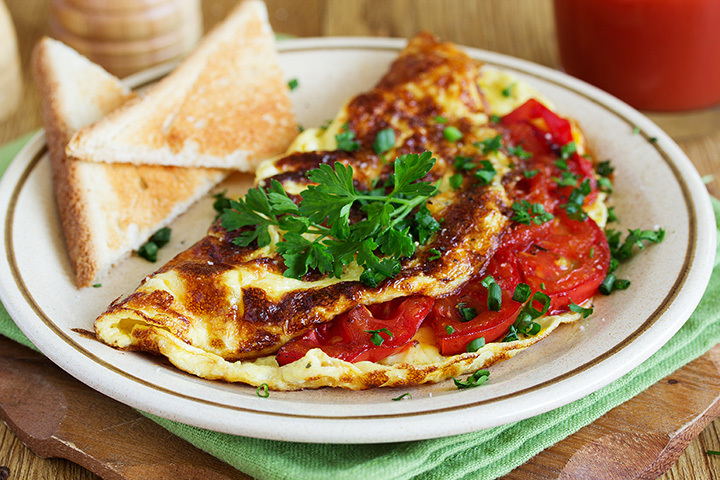 Among Julie’s “Awesome Omelets”—which come with hash browns and toast—you will find selections like chili and cheddar or Denver omelets. More significantly, you will also find a Reuben (yes, like the sandwich) omelet. Get it. The Catalyst Café & Espresso Bar began life as a coffee cart—the first in the state—in 1991. Now, this elegant, two-level eatery serves breakfast all day long in Missoula. Apart from its rotating list of delicious daily specials, you will find an almost-overwhelming list of ingredients that you can pack into a build-your-own omelet. Whatever else you choose, be sure to add the cumin-scented black beans. Loula’s Café is a bright spot on the already-bright breakfast scene in Whitefish. Walking in, the aroma of coffee and amazing house-made pie will hug your sense of smell. Then settle in and grab a Stumptown omelet—bacon, tomato, and avocado—to tickle your taste buds. When you need an omelet in Livingston, Pinky’s Café is the place to get it. Make your mouth happy with the carnitas omelet—slow roasted pork, black beans, green chilies, cheese, and avocado cream. Or go for something fresh and light, like the Caprese with tomatoes, mozzarella and fresh basil. If you’re getting ready for a mountain or river adventure adventure, stop into the Café at the Inn on the Gallatin. As you’ve probably guessed by now, this Gallatin Gateway eatery has plenty of tasty omelets to choose from, but why not go for the Spanish omelet? You can even sub vegan chorizo and make a vegetarian version. Daisy’s Deli in Great Falls specializes in fresh, natural, and organic ingredients. And that, of course, includes their omelets. The Southwestern chicken omelet is a hearty, tangy breakfast delight. But the Greek omelet is our favorite: Onions, dill, spinach, and feta. Opa!